Only available in 2 Inch x 40 yard rolls. Full Cases contain 24 Rolls of Premium Cloth Duct Tape. Comparable specs to Pro, Uline, 3M and Nashua. Contractor grade Duct Tape conforms well to irregular surfaces and has a nice adhesive hold. Tape does not curl or twist when applying. Tape has excellent water and abrasion resistance. Available in 1,2,3,4" x 60 Yards - Full Cases only. Multi colored camouflauge tape is great to use for hunters, military, or where blending of camo is needed. Olive, tan, black coloring, this cloth duct tape will adhere to most surfaces and has an excellent adhesive hold. Full Cases available only. Gaff Tapes specializes in providing gaffers tape and spike tape to the Arts and Entertainment industry. For more than 20 years, Gaff Tapes has been a wholesaler of specialty adhesive products. Known as the most affordable tape wholesaler, Gaff Tapes also stocks cloth duct tape, screen tape , and electrical tape. Feel free to give us a call on any of our tape products or sign up for our newsletter to receive special deals on gaffers tape, spike tape or console board tape. 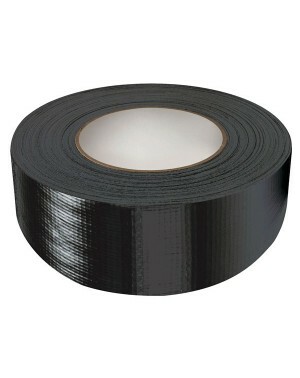 Our gaffers tape most popular seller is our 2” black gaffers tape by the case. When you purchase gaff tape by the case you save big. We offer free shipping on all adhesive products.